The global economic burden of coronary heart disease is projected to rise from an estimated 47 million disability-adjusted life years in 1990 to an estimated 82 million disability-adjusted life years by 2020. BCC Research reveals in a new study that the increasing adoption of new medical technologies worldwide should drive the demand for cost-effective treatment options for cardiovascular disease. 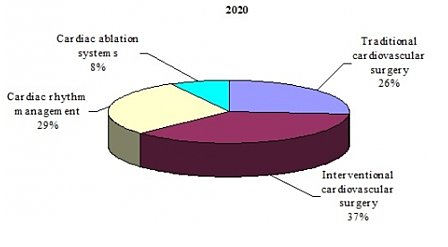 The global market for cardiovascular surgical devices is expected to reach nearly $37 billion and $57.2 billion in 2015 and 2020, respectively, reflecting a five-year compound annual growth rate (CAGR) of 9.4%. As a segment, interventional cardiovascular surgery devices should grow from nearly $12.6 billion in 2015 to $21.2 billion in 2020, demonstrating a five-year CAGR of 11%. Cardiac ablation systems should total nearly $2.4 billion and $4.5 billion in 2015 and 2020, respectively, growing at a five-year CAGR of 13.8%. Cardiac rhythm management devices and traditional cardiovascular surgery devices are projected to reach nearly $16.6 billion and $15 billion, respectively, in 2020. In July, Abbott announced FDA approval for the first fully-dissolving heart stent, Absorb. Now, Northwestern University engineers Guillermo Ameer and Cheng Sun have developed a 3D-printed biodegradable stent that can be customized to fit the needs of individual patients. Traditionally, decisions on stent placement and sizing have depended on the surgeon’s judgment and experience. If a stent does not fit correctly, it could move in the vessel and ultimately fail. Repairing the stent or placing a vascular graft exposes the patient to additional risk. Devices such as Adsorb, which dissolve slowly over time, can mitigate the long-term risk of a permanent implant. According to the researchers, the citrus-based polymer material they used is flexible and biodegradable, has natural antioxidant properties, and could potentially be loaded with anticoagulation drugs to minimize complications. Previous research with the polymer demonstrated its ability to inhibit clot formation, and Ameer stated that the material could easily be loaded with drugs to improve the healing process. The 3D printing technique can manufacture a stent in less than four minutes and produce up to 100 units at a time, faster than traditional manufacturing methods. Technological advancements such as healthcare robotics, hybrid operating rooms, and others are expected to boost the global cardiovascular surgical device market. The healthcare industry is gradually transforming from conventional operating methods to intraoperative approaches for surgeries. An estimated 234 million major surgeries are performed every year worldwide, which include cardiac catheterizations, endoscopy, and neurosurgery. The increasing demand for minimally invasive surgeries is driving the growth of hybrid operating rooms. Also, the increasing sophistication of surgical techniques and instrumentation, including miniature cameras and robotics, has supported the recent shift from open heart procedures to minimally invasive heart procedures performed percutaneously. This has produced an increase in the number of therapeutic options, and a decline in morbidities associated with heart surgery. Minimally invasive procedures offer the major advantage of eliminating the need for sternotomy, thus reducing the risk of postsurgical complications and infection. These key drivers are boosting growth in the surgical device market. BCC Research’s study, which analyzes multiple technologies and procedures related to cardiovascular surgical devices, examines four categories of cardiovascular surgery: traditional (open), interventional, cardiac rhythm management, and cardiac ablation procedures. The report also reviews regulations, reimbursement issues, and patents granted from 2011 through mid-2016 to identify patient safety, regulatory review, and insurance coverage issues for stakeholders. Global market drivers and trends, including projections of CAGRs through 2020, are provided.